The Bonaire Whiptail is a unique species to the islands of Bonaire and Klein-Bonaire, Dutch Caribbean. With shimmering turquoise on its tail and feet, the Bonaire Whiptail is also called the Whiptail Blue Lizard or race runner and belongs to Family Teiidae or Teiid lizards. Colloquially, in Papiamentu, it has other catchy names like, Blaublau, Blausana, Blòblò, Kodobo and Lagadishi (general word for a female or juvenile lizard). 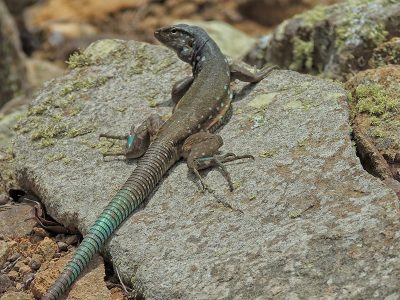 It was originally classified as a subspecies of the Curaçao Whiptail (Cnemidophorus murinus) but since 2010, has been considered a full species of Cnemidophorus ruthveni, with a slightly smaller body and differences in coloration. Posterior view of a male Bonaire Whiptail lizard, showing its shimmering turquoise-blue tail, feet and spots on the head and body. 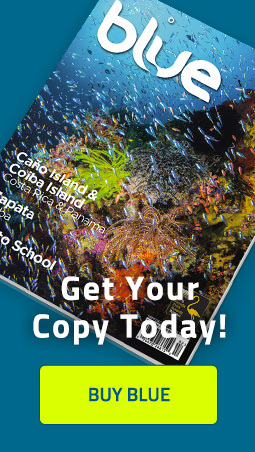 Unlike other Cnemidophorus sp. the Bonaire Whiptail (as well as those in Aruba and Curaçao) is mainly a herbivore. The males have the electric aqua-blue coloration and distinct spots on the head, while the females are smaller and tend to be brownish in color, with bleak spotting, that appears marbled. 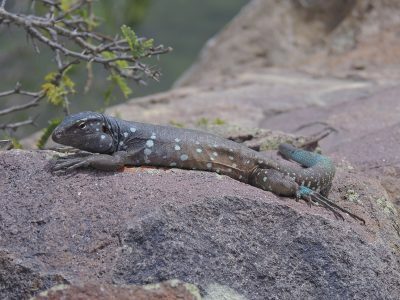 These lizards are found everywhere, even on cacti or among the semi-arid brush and rocky terrain on the summit of Mount Brandaris!